The first prerequisite when determining a profit target is the 1:3 ratio, meaning that the exit point should be at least 3 times the maximum loss (stop). The profit target is being set on the nearest to the trigger support or resistance (the most possible points for the price to stop), depending on the strategy. 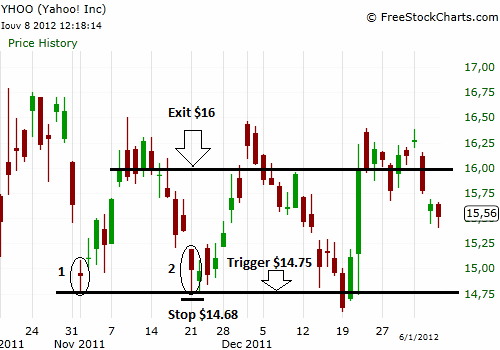 Below is the 5 minutes chart of AIG. 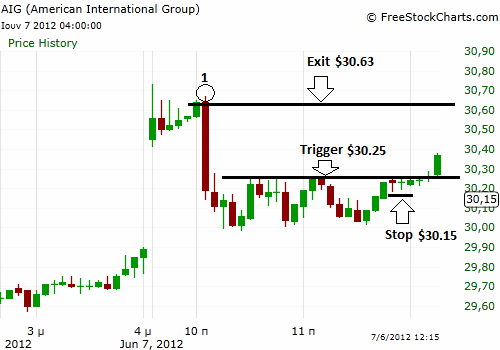 At $30.25 there is a breakout trigger and we are thinking of entering the trade. First of all we have to set the stop which is below the nearest to the trigger support, at $30.15 (10 cents/share). The target (exit) will be the nearest to the trigger resistance at almost $30.70. Notice that we will exit not exactly at point 1 which is the high of the candlestick, because price might never succeed to reach this point, but at $60.63 (38 cents/share possible profit). We will exit sooner because trapped sellers might start selling earlier to assure the closing of their positions. Conclusively, stop is 10 cents and target is 38 cents and it more than satisfies the 1:3 ratio (it’s 1:3.8), so we can enter the trade. Here we describe a day trade and that’s why the stop and the target are measured in cents. If it was a swing trade designed on a daily chart, the stop and the target would be much more wide (maybe measured in dollars), but the rationale behind the set up would be the same because charts are fractals. 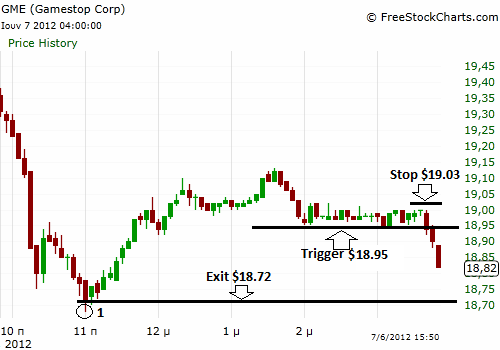 In GME 5 minutes chart (below), there is a breakdown entry at $18.95. The stop must be placed at $19.03 (nearest to the entry, resistance). Profit target is at $18.72, where we can spot the nearest to the entry strong support. So maximum loss/share is 8 cents and maximum possible profit is 23 cents which satisfies the 1:3 ratio. Again profit target is not being set at the minimum of the red candlestick at point 1, because buyers might open long positions before price reaches this low. 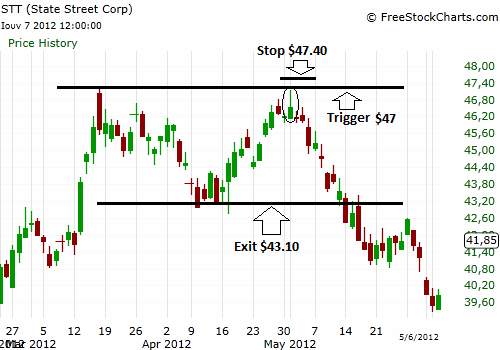 In STT daily chart there is a resistance at $47. We can use it as a trigger to open a short position when price revisits this level. The entry point is the green circled candlestick. We will enter at $46.70, put a stop above the resistance at $47.40 and the profit target is the nearest to the trigger support at $43. So, the stop is 70 cents/share ($47.40-$46.70) and the profit target is $3.60/share ($46.70-$43.10). The ratio here is 1:5, far better than the 1:3. It is a swing trade so the stop and the profit target are wider than in a day trade. In YHOO daily chart we entered at the red circled candlestick at point 2 (entry $15), we put the stop at $14.70 (30 cents/share) and the target was at $16 ($1/share possible profit). The ratio here is almost 1:3. Notice that we first spotted a fresh support at point 1 and then entered long the first time price revisited the support.